Republican Sam Brownback was elected governor of Kansas in 2010 and is now running for re-election. An extreme Tea Party conservative, he has pursued a radically right-wing agenda in Kansas with little constraint from a Republican controlled state legislature (especially after he led a successful effort to purge relative moderates from his party by more extreme conservatives in the 2012 primaries). Central to his program were drastic tax cuts enacted in 2012, with a further round of cuts in 2013. They were one of the largest tax cuts ever enacted by a state in percentage terms, and were labeled by Brownback to be a “real live experiment” of the conservative vision of small government leading to fast growth. The tax cuts would be like a “shot of adrenaline into the heart of the Kansas economy” he asserted, employment would boom, and the faster growth would lead to greater total tax revenues generated (despite the lower rates) due to a then larger economy. But it has not happened. Employment in Kansas has fallen relative to the rest of the US since Brownback took office. This post will first describe in more detail the tax cut measures, and will then look at the impact on employment. b) Elimination of state business taxes for most companies in Kansas. This covered over 200,000 firms in the state, and while purportedly aimed only to benefit small businesses, the definition included at least several of the subsidiaries of Koch Industries (owned by the multi-billionaire Koch brothers, which is based in Kansas and which has provided strong financial support to the campaigns of Brownback and other Tea Party favorites). No other state has eliminated such taxes. c) And partially offsetting the personal income tax cuts, the state sales tax rate was raised. Such a tax increase affects the poorest the most. Tax rates were then cut further in 2013. Among other measures, the rate for the top personal income tax bracket is being phased down from the 4.9% of the 2012 law to just 3.9% by 2018, a cut of over 20%. And the regressive tax cuts came on top of a system that already taxes the poor more than the rich. 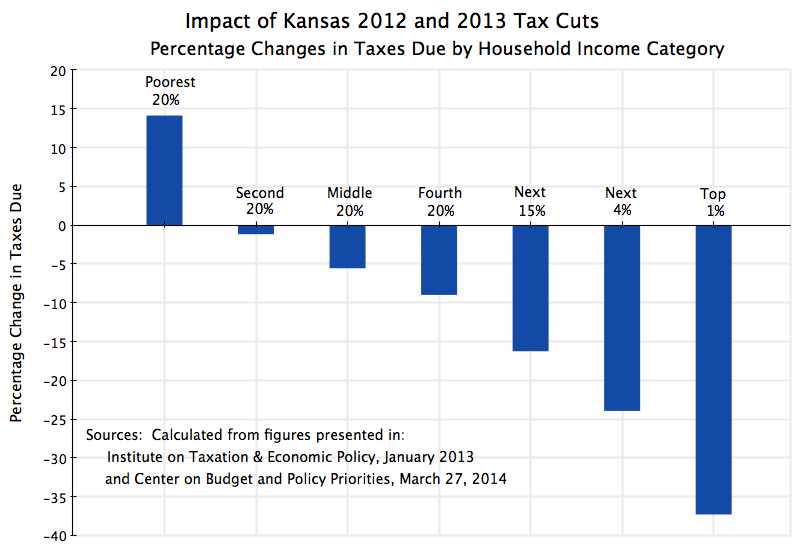 The poorest 20% will now be paying close to 11% of their income in state and local taxes in Kansas. Those in the middle (between the 20th to the 80th percentiles) will be paying between 8 and 9%. But the richest 1% will be paying less than 4%. The tax cuts have not, however, led to an increase in government revenues. As will be discussed below, employment has not gone up as a result of the cuts. Rather, tax cuts have led to cuts in tax revenues received. While most of us would find this not at all surprising, Brownback was advised by Arthur Laffer, famous for the so-called Laffer Curve, which posits that tax cuts will lead to such an increase in employment and income that tax revenues will rise despite the lower rates. It has not happened. A recent report from the Rockefeller Institute of Government found that state tax revenues in Kansas between the second quarter (April to June) of 2013 and the second quarter of 2014 fell by 22% in total, and fell by 43% for the state personal income tax only. These reductions were larger than in any of the other 50 states. The 2012 tax cuts went into effect as of January 1, 2013, and the taxes collected in the second quarter of that year will then mostly reflect what was due on incomes earned in 2012. The reduction in revenues due and collected in the second quarter of 2014 (primarily on incomes earned in 2013) will then represent the first year impact of the 2012 law. The reduction in tax revenues generated as a consequence of the sharp tax rate cuts should surprise few. The non-partisan Legislative Research Department of the Kansas state legislature has estimated that, as a consequence of the tax cuts, state revenues will fall by an estimated $730 million in FY14, and by a cumulative $5.2 billion by FY18. These are large amounts for a small state. The predictable result has been sharp cuts in the government budget. Much of this has been borne by education, which is close to inevitable simply because it constitutes such a large share of the state budget. State funding for K to 12 education has been cut by over 15% during Brownback’s term in office, and he has proposed another 2% cut for FY2015. Despite such expenditure cuts, the state budgetary situation is now precarious. This has led to cuts in Kansas government bond ratings by Moody’s and S&P. It will now be more expensive for Kansas to borrow for public investment and other needs. 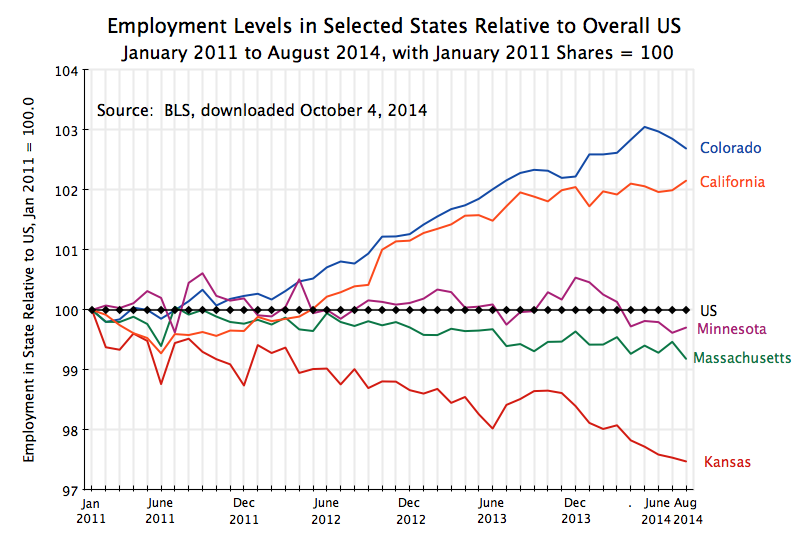 The chart shows what has happened to employment in each state expressed as a share of total US employment, normalized so that the January 2011 shares are all set to 100. Thus it will show whether employment in the state grew at a faster, or a slower, pace than overall employment in the US. The share will go up if employment in the state grows at a faster pace than in the US as a whole, and the share will go down if employment in the state grows more slowly. Kansas has not performed well. Its share in US employment has fallen, and more or less consistently fallen, since Brownback took office. There is no indication that the massive tax cuts, passed into law in May 2012 and expected well before, have led to employers shifting to the state or expanding there. In contrast, the Blue States of Colorado and California have done especially well, while the Blue States of Minnesota and Massachusetts have seen employment grow at roughly the same pace as the US as a whole. a) First, while there is no evidence that the tax cuts led to a boom in employment, there is also no clear evidence that the tax cuts led (at least so far) to major reductions in employment. Rather, employment in Kansas has trended steadily downwards over this period relative to the rest of the country, with the tax cuts having little effect one way or the other. State level employment depends on many things, and the state tax regime does not appear to be a terribly important one. What matters more will likely be state structural issues, such as the mix of particular industries in the state (including agriculture), the age distribution of the population in the state, the mix of high skilled vs. low skilled workers in the state, and so on. b) While Kansas performed poorly relative to the other states depicted in the chart above, there were fifteen states that did even more poorly than Kansas over this period. Overall US employment grew by 6.4% over this period as a whole (1.75% at an annualized rate), while employment in Kansas grew by only 3.7% (1.0% annualized). But of the 50 states, employment growth was worst in Alaska, with growth of only 1.6% over the period (0.4% annualized). As noted above, state specific structural issues will matter. c) Finally, one should recognize that the period so far has been short. While Brownback can clearly no longer claim that there will be an immediate or even near-term positive impact on employment, he is (not surprisingly) now claiming that it will take more time. One can of course not disprove this until more time has passed, but the question is how long does one need before one recognizes the failure. But we do know that the tax cuts have devastated state finances, leading to the rating downgrades and to budget cuts that are slashing expenditures in important areas such as education. There is good reason to expect that such cuts in education will have adverse impacts on employment in the longer term. When the current generation of students graduate, a larger share will not have the level of skills required for good jobs, if any jobs. Potential employers will shun a state where they cannot hire staff with the skills they need. I would wager that the long term impact will be negative, not positive. But what one can say now with confidence is that the evidence is clear that massive tax cuts of this Red State “experiment” have not led to a near term boom in jobs. It is also clear that such tax cuts do lead to cuts, not increases, in tax revenues. The experiment has failed to fulfill the claims originally set out for it. This entry was posted in Fiscal Issues and tagged employment growth, income distribution, job creation, tax system, taxes by aneconomicsense. Bookmark the permalink.